The American Institute of Architect’s community assistance program contributed over $125,000 of consulting time to our community! Their national team offered expertise in planning, urban design, greenway design, landscape architecture, land use, economics and public private partnerships. Check out their innovative plan! In 2011 the Southeast Greenway Campaign was selected to participate in one of the American Institute of Architects’ (AIA) community assistance programs. This program, called a Sustainable Design Assessment Team (SDAT), is intended to help communities develop a vision and framework for a sustainable future. The AIA brought a national team of consultants to Santa Rosa in June 2011 and over 300 people participated in town hall meetings and round table discussions. 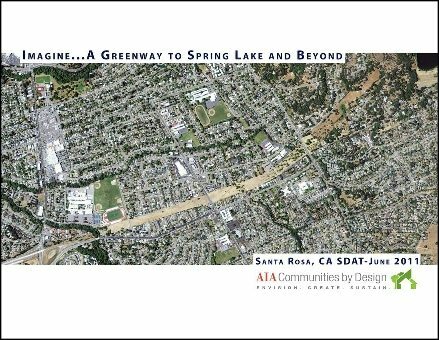 The AIA team’s final report, Imagine a Greenway to Spring Lake and Beyond, reflects their expertise and the community’s input. The key recommendation of the plan is that the Greenway be used as a corridor for non-motorized transportation consisting of bicycle and pedestrian pathways. Community gardens, orchards, and a neighborhood park round out the plan. Think of this as a “concept plan” that presents a vision for the property.